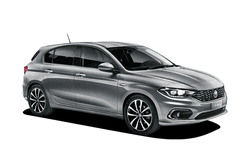 Fiat's new Tipo is more about space, practicality, and comfort than zooming around corners, but the car is well set up and more than capable of meeting all of your transportation needs. What it lacks in pick up power, it more than makes up for with all the of the comfort and style, both inside and out, that as made the Fiat a well-known name. Its spacious interior comfortable seats 5 and also has a surprising amount of storage area in back. No matter what your reasons are for needing a rental car, the Fiat Tipo is a great choice that will not disappoint! Make your reservation today and see for yourself what the newest offering from Fiat has to offer you and your passengers as you travel the road ahead!